Upon arrival in Arequipa, we will transfer you to your hotel. You will start your tour at the Museum of Andean Sanctuaries where you will visit the Juanita Mummy, a 14-year-old daughter of an Inca dignitary mummified by cold winds of Arequipa. She was found at the snow-capped Ampato Mount in 1995 and was exhibited at the National Geographic Society in Washington D.C. You will then continue your tour to the Main Square, known as one of the most beautiful squares in Peru because it was built of sillar (white volcanic rock) and features carved arches. 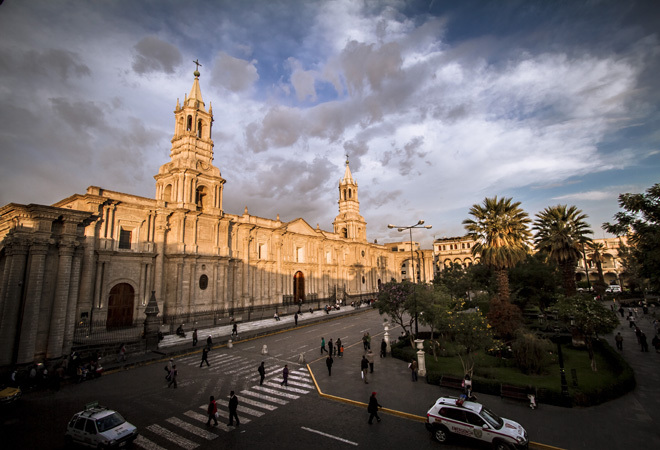 The square is located next to the impressive Arequipa Cathedral, built in the 17th century and fully rebuilt after several earthquakes. You will then visit the Church of the Society of Jesus (1590), considered a classic example of the local baroque architecture, which houses an exceptional collection of paintings and murals. You will then visit the Carmen Alto Scenic Viewpoint, located in front of the Chili River, from where you will have a scenic view of the city before passing by the Yanahuara Scenic Viewpoint. You will end your city tour at the Santa Catalina Monastery, built in 1579, which is an authentic medieval cloister and a small religious citadel used to date. 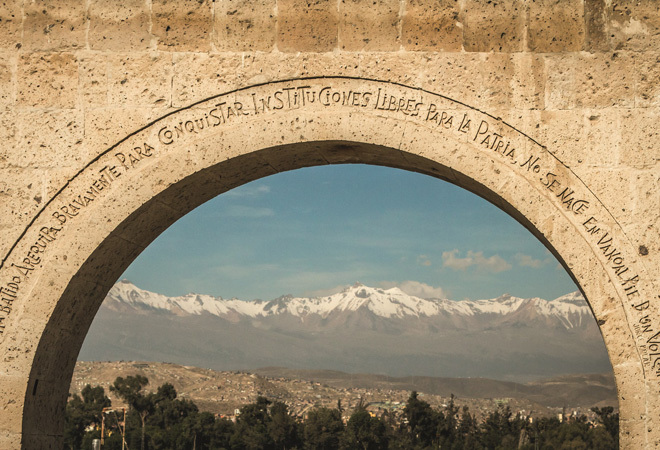 Today you will enter the beautiful Pampa Cañahuas Reserve by skirting the volcanoes that surround the city of Arequipa. This is a broad plain populated by elegant vicuñas, native Andean camelids that are a national symbol. You will then head to Vizcachani, the Toccra Pampas and will skirt the crater of the Chucura Volcano to reach the Los Andes Scenic Viewpoint in Patapampa (4910 masl), from where you can see the various volcanoes that surround Arequipa. After this visit, you will enjoy lunch in the legendary town of Chivay before heading to your hotel for the rest of the evening. 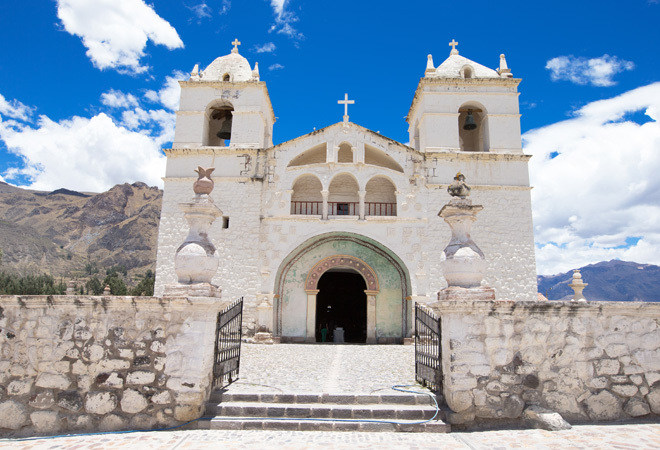 Today’s tour will start at the breathtaking Condor Cross, from where you will be able to appreciate the Colca Valley, which is one of the world’s deepest canyons with over four kilometers at its deepest side. 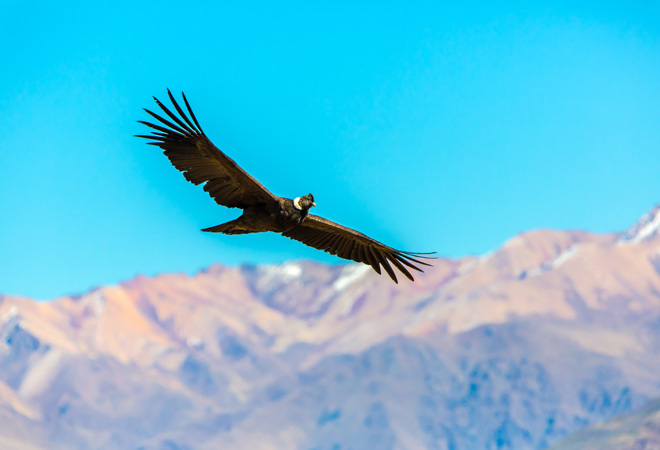 You will get to marvel at the huge and majestic condors flying at a few meters of distance above and around you. After visiting the condors you will return to Chivay where you will stop to visit the towns of Pinchollo, Maca, Achoma and Yanque, which will include visits to the Antahuilque and Choquetico scenic viewpoints. After a delicious lunch, you will return to Arequipa. Meals included: Breakfast and lunch at Alpaca Chef Cafe Restaurant. We will transfer you from the hotel to the airport. After your tour, you will be transferred to the airport to either continue your tour to another city or return to Lima for your international return flight. This tour integrates both culture, and wildlife and gives you time to soak in pools of hot thermal waters. 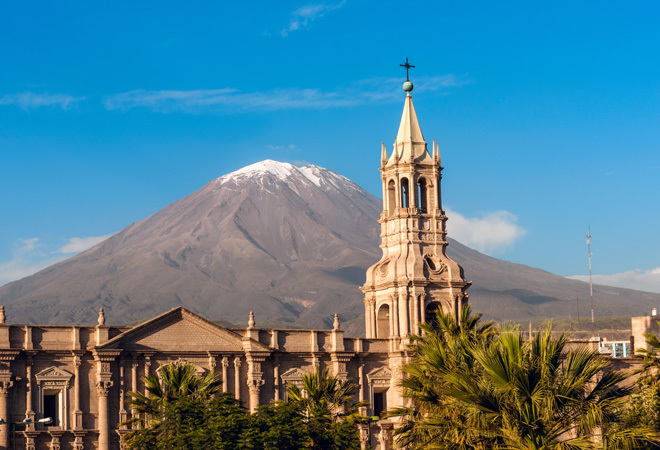 In Arequipa, you will enjoy the view of volcanos and the fertile valleys. Moreover, you become familiar with the integration of European and native building techniques, that characterizes the major buildings from colonial time. During Inca times children were offered on the mountaintop to apiece the god, leaving priceless information about these ancient rituals, which we will study. This trip also gives you the opportunity to get a closer look at some of the most iconic animals in Peru such as the Andean condor and the vicuña around the Colca Canyon and taste the spicy local cuisine. All transfers airport/ hotel/airport are private. Entrance to la Calera hot springs.